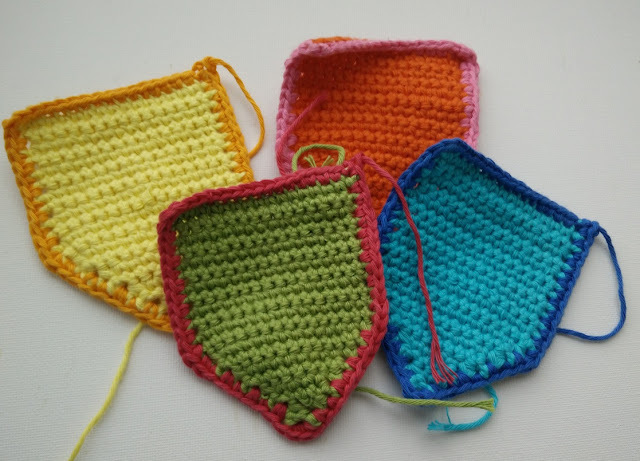 My week off is going just as I had hoped, lazily and with plenty of crochet. It was very important to me to actually get something done this week, thought out, started and finished and not just half way there before I run out of time/enthusiasm. That's how far I had got on Monday when I last told you about this picture I have been making. 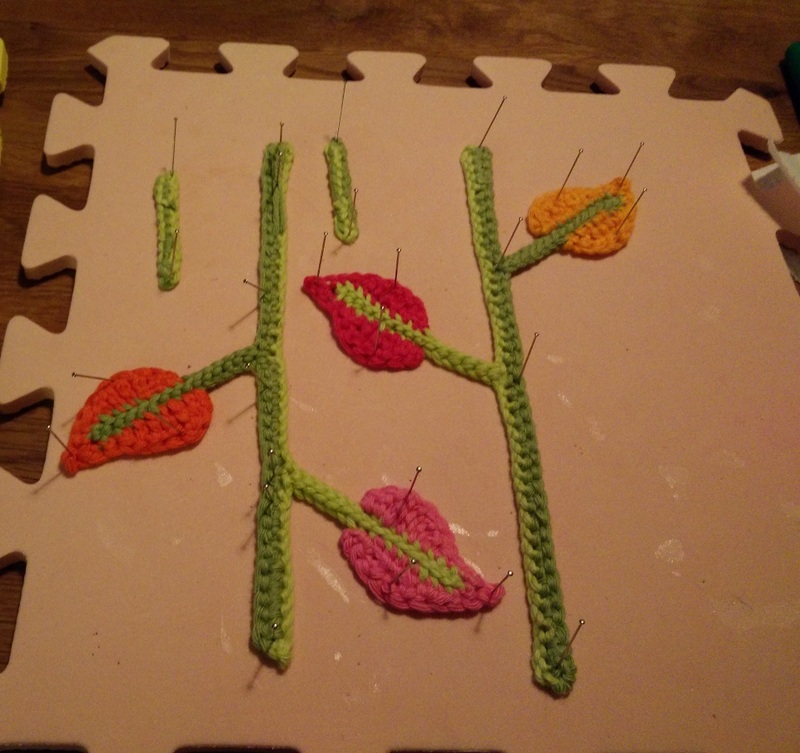 By Monday evening I had all the other stems and leaves made and had everything pinned out nicely on my blocking mat and given a generous application of PVA glue to stiffen it. 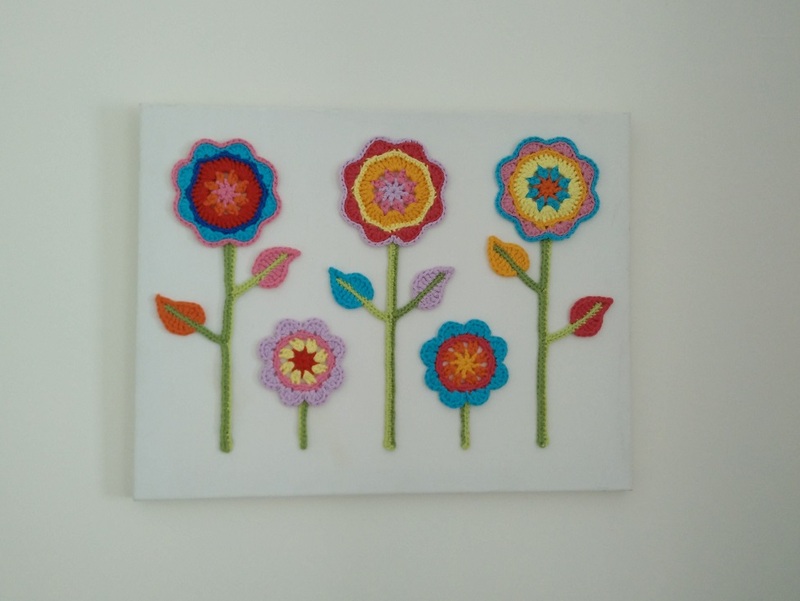 I still had the problem of sticking it to the canvas, I have never used a glue gun but I was sure that was the way to go, so the next day I took myself off to the shops to buy one. It’s brilliant! Not sure how I have made do without one before, everything was quickly stuck down and I am so pleased with it! 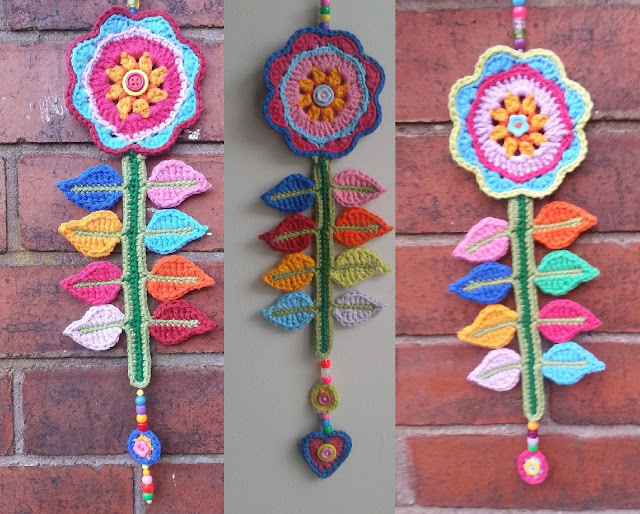 Last week I found myself needing a quick project to make for a friend’s birthday and as they are so pretty I turned to Lucy at Attic24’s Happy Flower pattern. 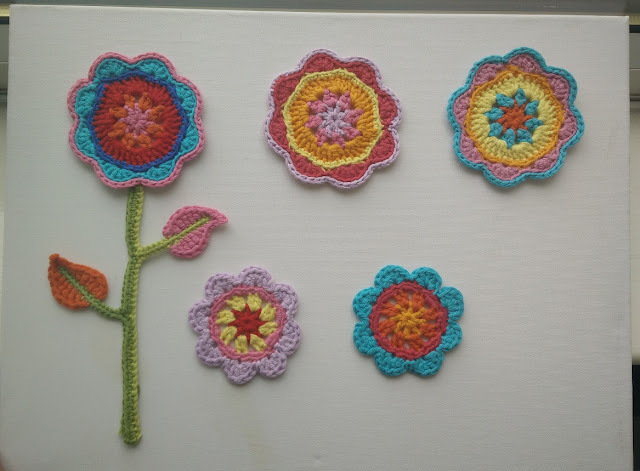 I love these flowers so much; they are one of my go-to things when I want to make something girly and pretty. 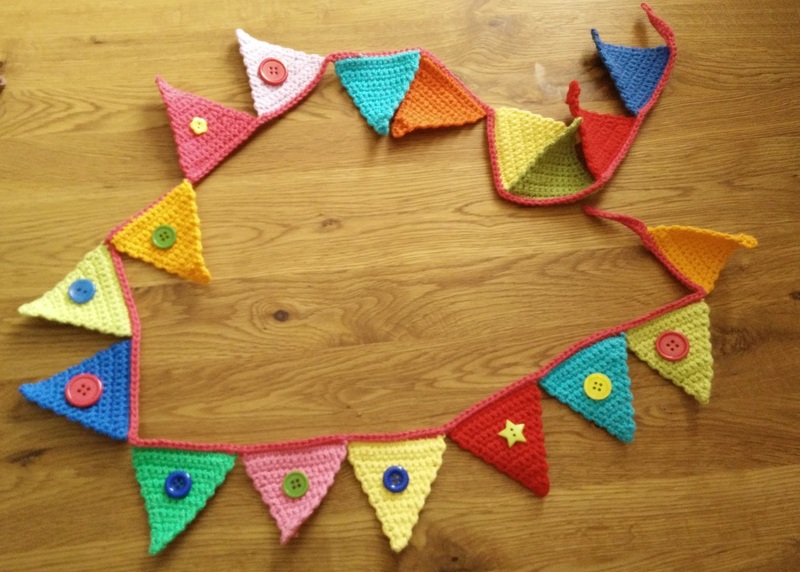 I’m sure they aren’t everyone’s cup of tea but I adore the bright colours and cheerfulness of them. I’ve made quite a few of these before but never got around to making one for myself. To be honest I’m not exactly sure where I would put one if I did make one for me; every hook or likely hanging place already has something hanging from it. 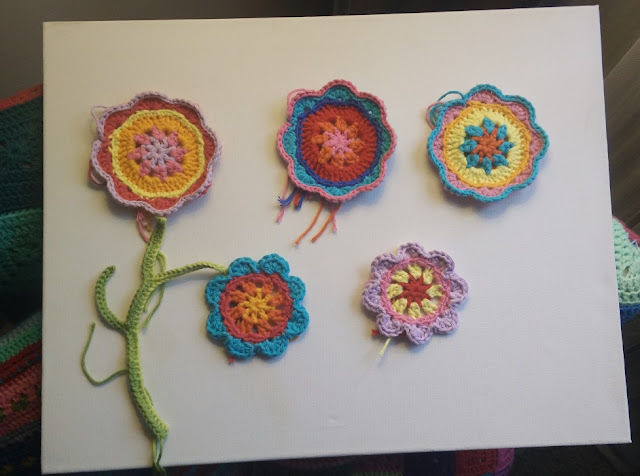 So I got my thinking cap on and rooted out an old canvas and started hooking up some flowers to stick on it, hoping I would be able to get a similar effect to the full hanging Happy Flower decoration. 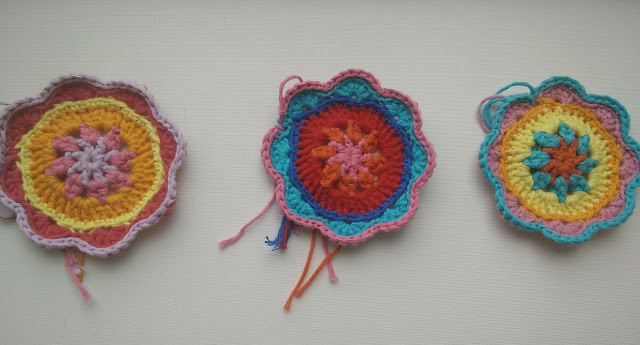 Three of the large flowers from Lucy’s pattern and then a couple of cobbled together smaller versions of my own doing, fill the space quite nicely. But they do look a bit like small mandalas on the canvas and not much like the original. 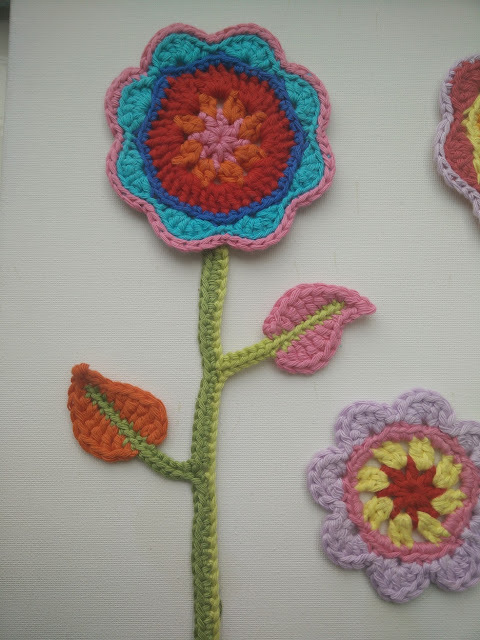 My favourite part of the Happy Flowers is the stem and leaves, I like the shape and the way they are made, so I made a less complicated stem for one of my flowers to see if that would work. Nice but needs blocking! 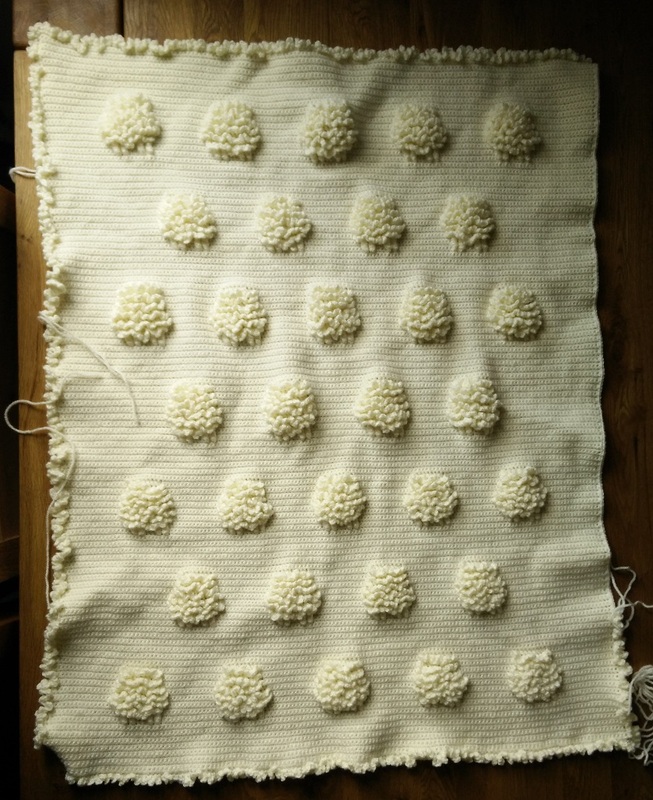 Well, not the heavy duty pinning and PVA gluing blocking they will eventually all get, but a press with the iron and a quick tidy up of all the ends that need sewing in, it makes a huge difference. I do like that stem and those leaves, similar to the original but less busy as I am going to need a few more of them for this canvas. I can’t get this finished just yet as I need to paint the canvas first, at some point it has had tea splattered on it (oops) so I am going to give it a quick coat of white before sticking these flowers down. How I am going to stick them, I’m not quite sure - would super glue work? It is times like this I wish I had a hot glue gun, maybe something to think about investing in. Thought I would pop by and let you know that my Bonfire Bag pattern is now ready and available for your hooky pleasure here! 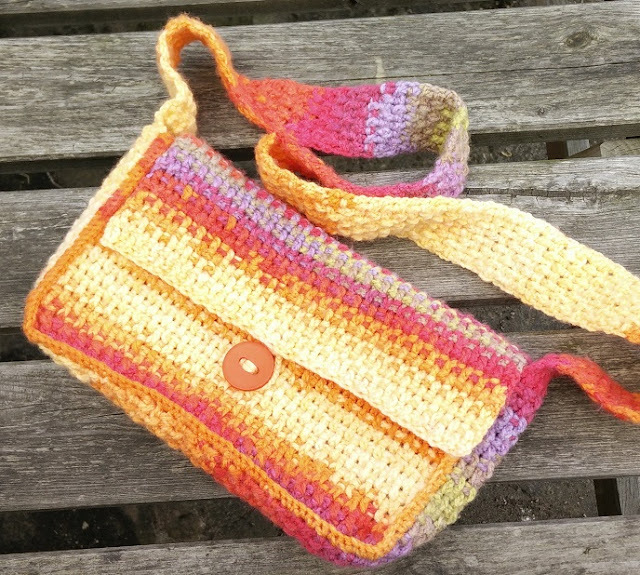 I love this bag; it's a very simple one to make once you get the hang of the weavey post stitches. I've done my best with a photo tutorial for the pattern to try to explain these the best I can, but what makes sense to me won't necessarily make sense to anyone else! 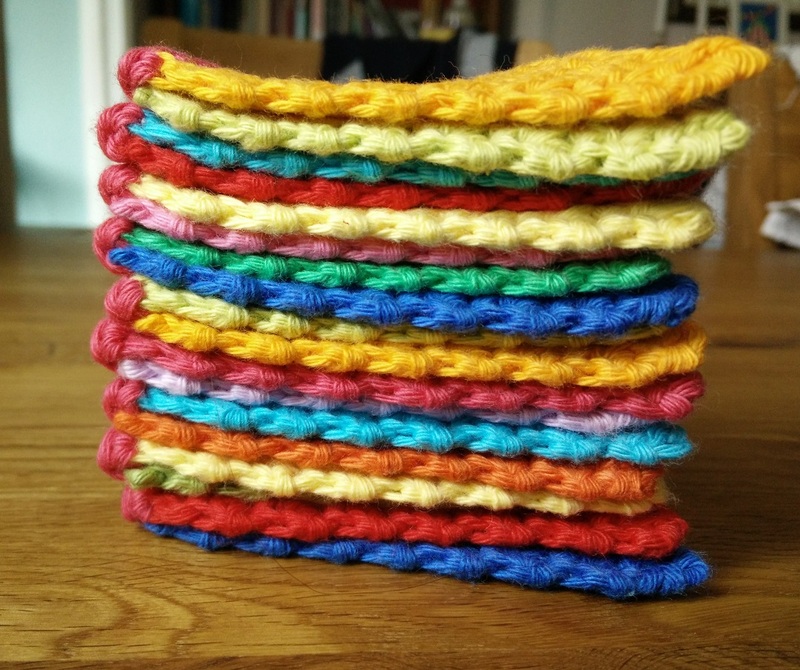 So, if you do fancy having a go at making this bag I would love to hear how you got on with it and see a picture of the finished item. 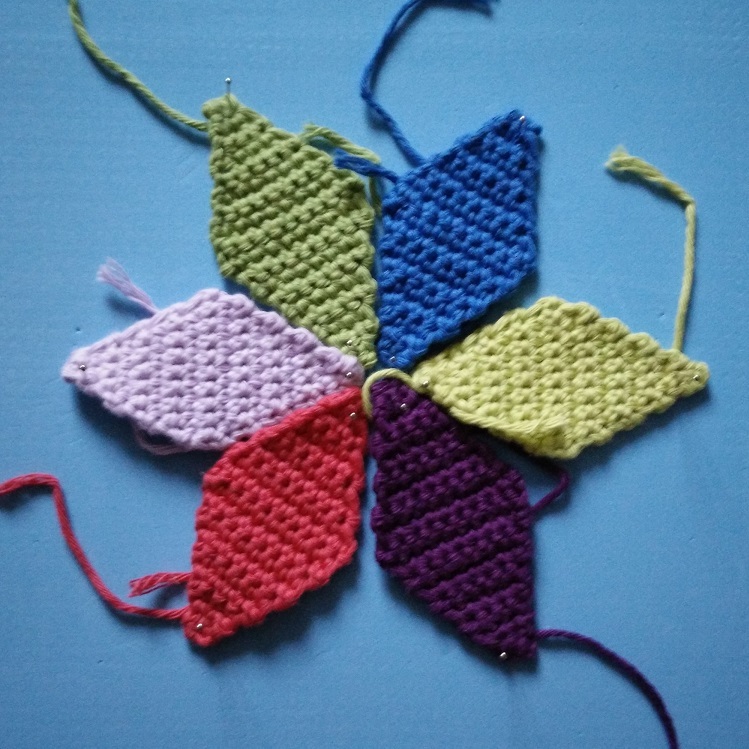 Either leave me a comment or find me elsewhere (ravelry, twitter, facebook - @hookingcrazy). 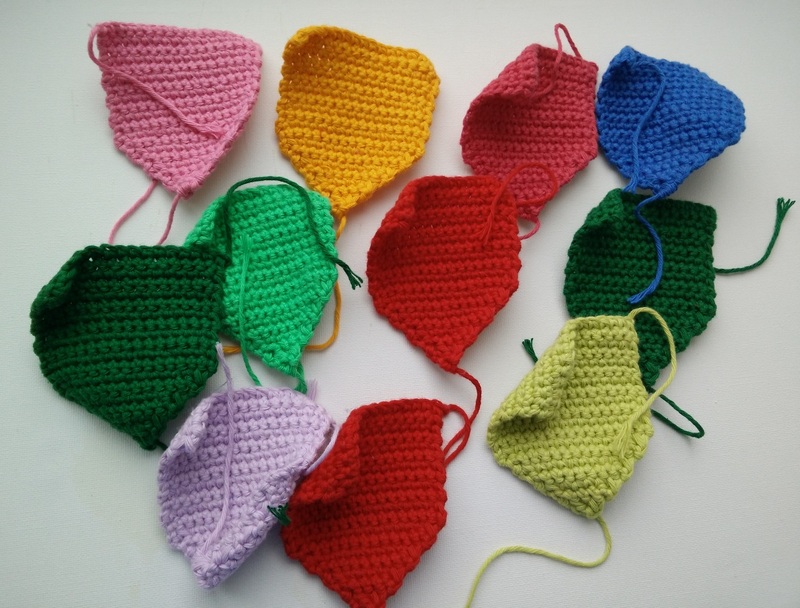 I've got so many things that I want to crochet at the moment my trouble is knowing what to do first. 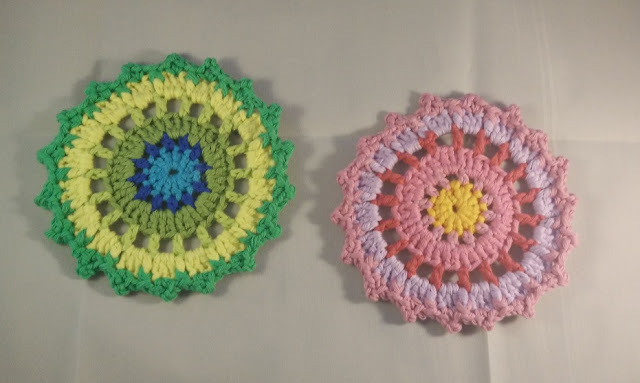 I'm still inching away at the sheep blanket and having a bit of a colour break now and then making diamonds and doilies. I do wonder when a house can have too much doily? 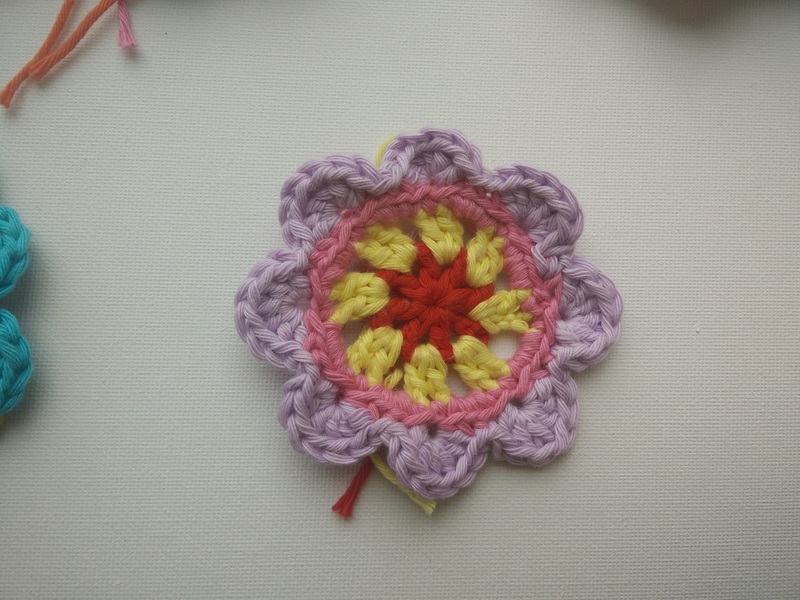 I think I reached peak doily about a year ago and now each little frilly circle is just adding another layer of twee. Why are they so much fun to make? 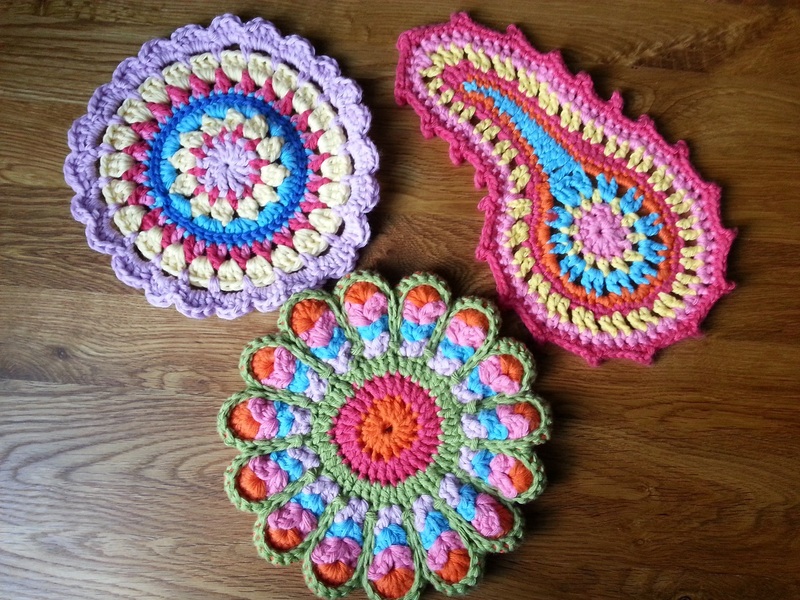 I would gift them but I can't remember the last time I heard someone say 'I would love a doily, if only I knew where I could get one'. I’ve started the New Year with lots of plans and enthusiasm. I hope that it isn’t all just grand ideas; I really want to get stuff done. 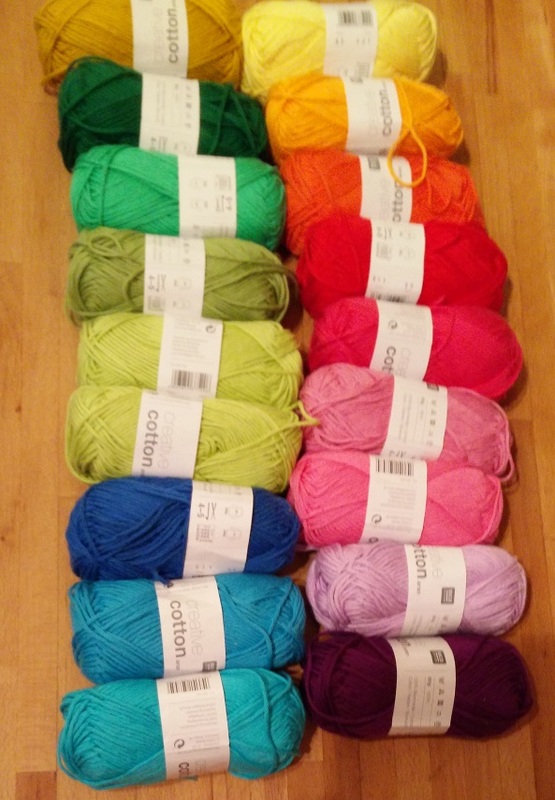 With this renewed urge to crochet I went on a yarn hunt so I could get started carpe-ing the Diem. But In the chaos of post-Christmas disarray the only yarn I could find was my Rico creative cotton because, that’s what I had been using last. 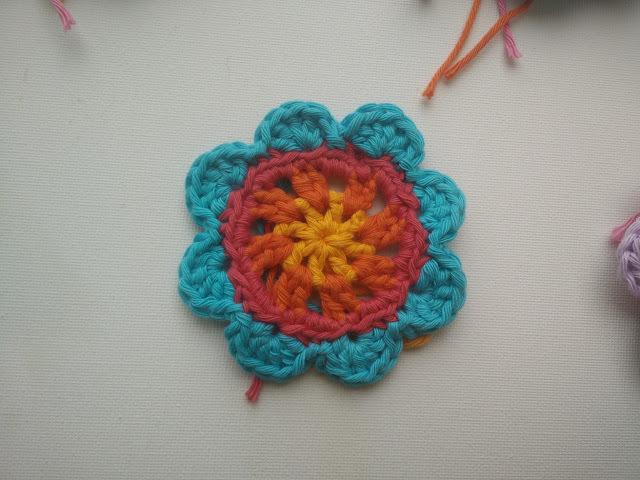 Not to worry, pretty yarn makes pretty things - usually. I started crocheting and this is what I came up with, lots and lots of diamonds. I think the basic idea was to make a patch work quilt type of design, for a cushion or something. 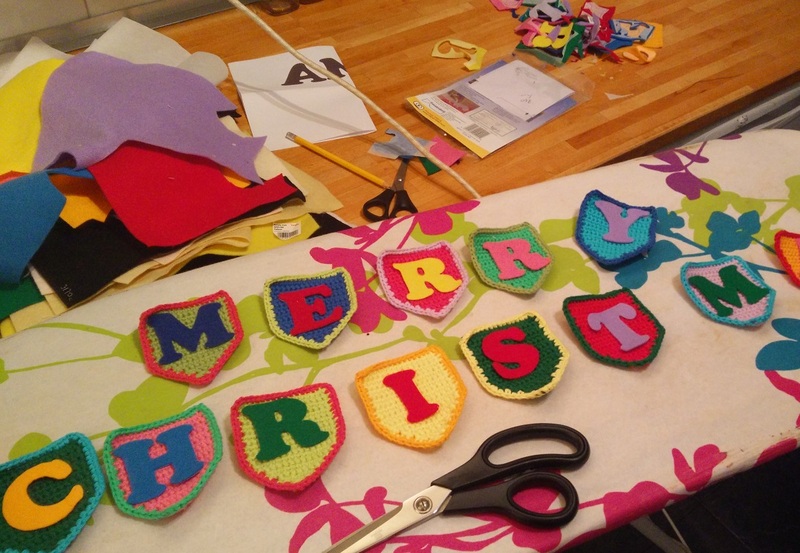 I thought it was all going well until I came to actually pinning the diamonds out to see what they looked like. Anyway, I digress. I had a slight problem with the diamonds, the angles aren't quite right; there is a bit of a gap in the 360 degrees needed. 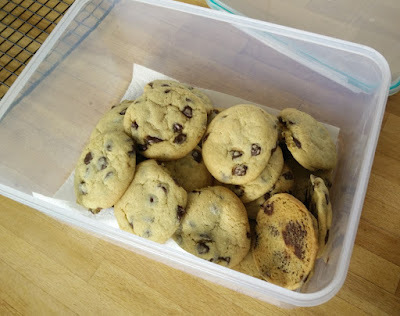 Perhaps I should have measured more carefully before making dozens of the things. 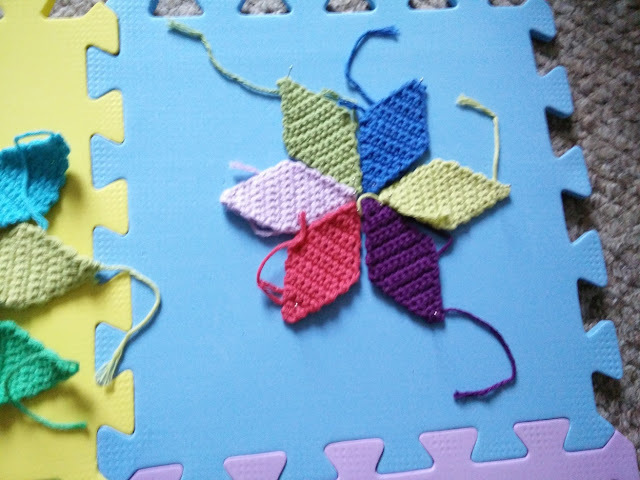 I may or may not be able to fix that with a bit of creative sewing together of the shapes, if not I should be able to find something else to do with them. 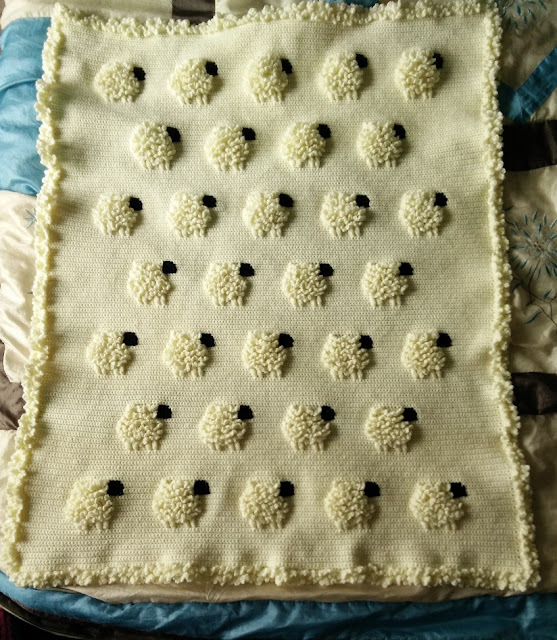 Yes, another sheep blanket! 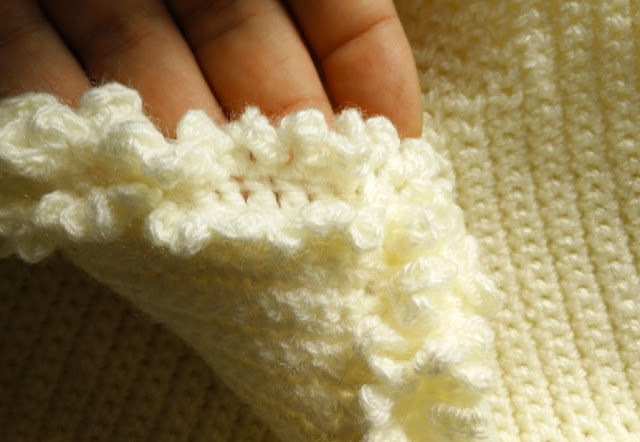 If you read my posts about the first one that I made my feelings about these blankets is mixed. I enjoy the repetition and creating something so darn cute, but the endless cream can be very tiresome. That isn’t to mention my stand-out memory of the first one, the edging! 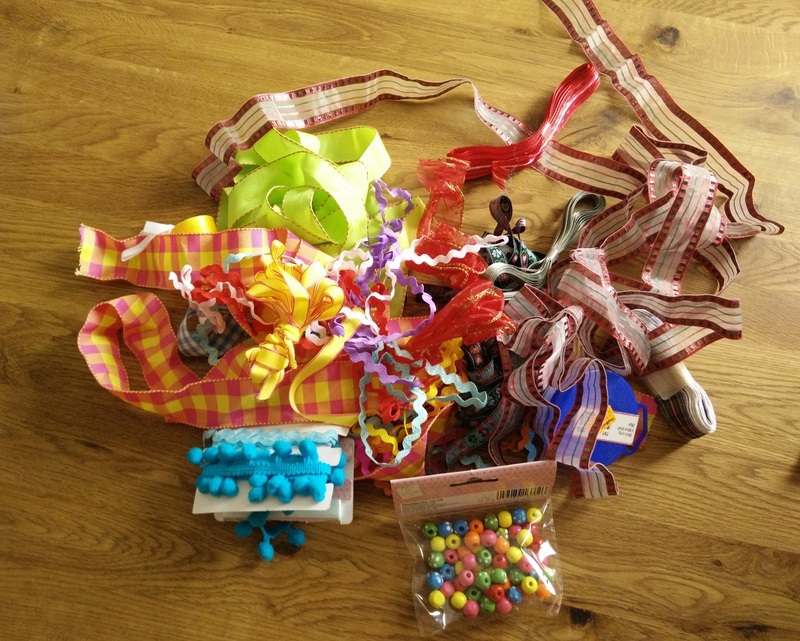 Oh my word it was tedious; it seemed like days spent making endless chains for the frill. So why am I making another one? I couldn't help it, it's so lovely. Hello everyone! I do hope you had an excellent Christmas. 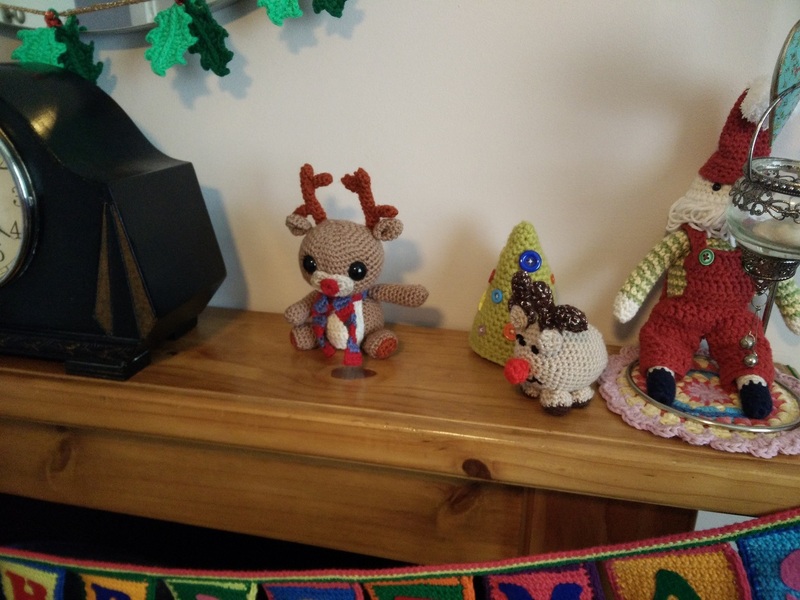 My build up to Christmas was busy, both on the crochet front and all the other stuff that needed doing and since then I have just flopped and done very little. The manic crocheting before Christmas was making these African Flowers. I had given myself just over a week to make one of Heidi Bears dogs, to be a present for someone. That would have been fine if I hadn't had to go to work too and sort the rest of the shopping and stuff out. 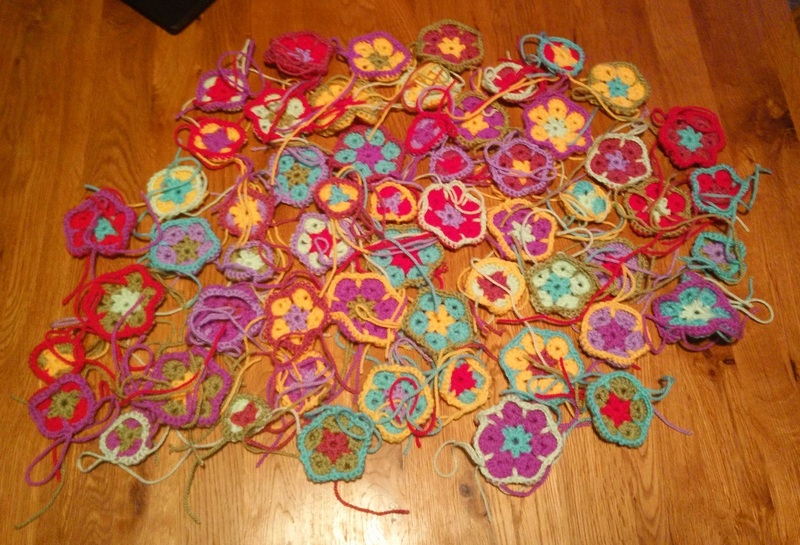 So every spare moment was spent making flowers, sewing ends in and ruining my eyesight for a few days. But I got there in the end! Isn't he lovely? I am so pleased with how he turned out, his sweet little face and the stout bodies on these animals are just so cuddly. 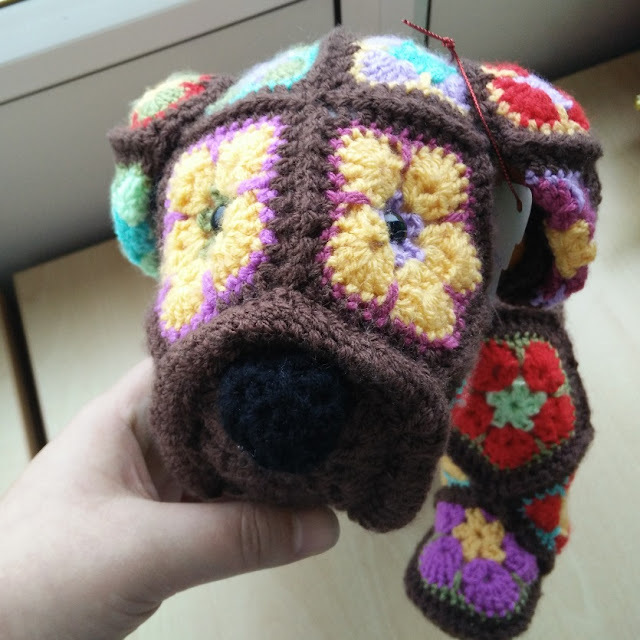 Sorry about the rubbish photos, I had literally finished sewing the nose on about 10 minutes before it was given to my friend so my photo opportunities were limited. 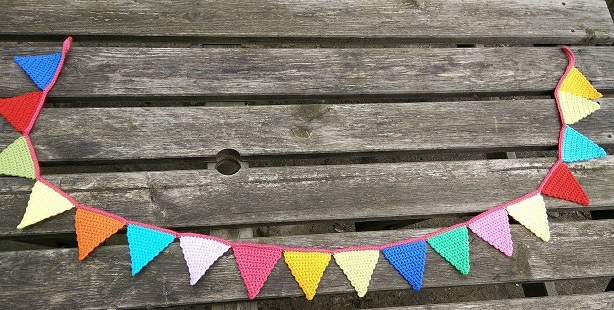 As well as the dog there was the bunting I was making too. 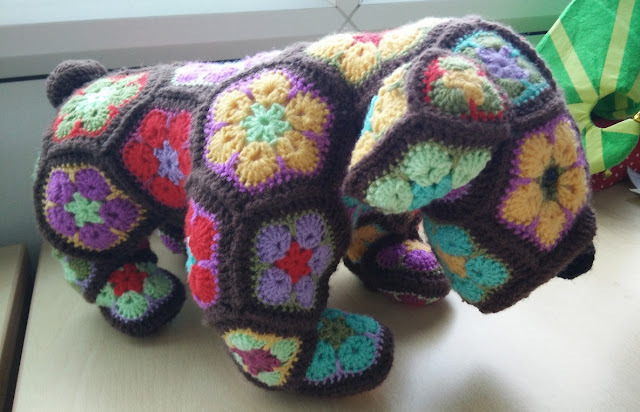 I had been so close to finishing it and so excited to see it all made but had a major mess up with the bondaweb and had to wait for more to arrive before I could get it done. It was my own fault, I hadn't checked the size font I had used to trace my letters and already ironed them on to the felt so couldn't re-use the bondaweb and had to bin it all. 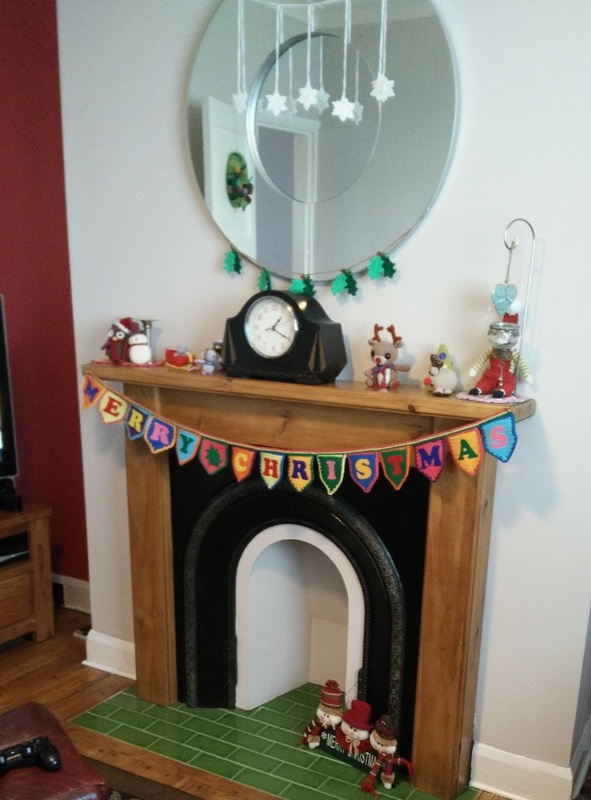 Luckily the Amazon fairies arrived in time for me to be able to get it sorted in time to give as another present. 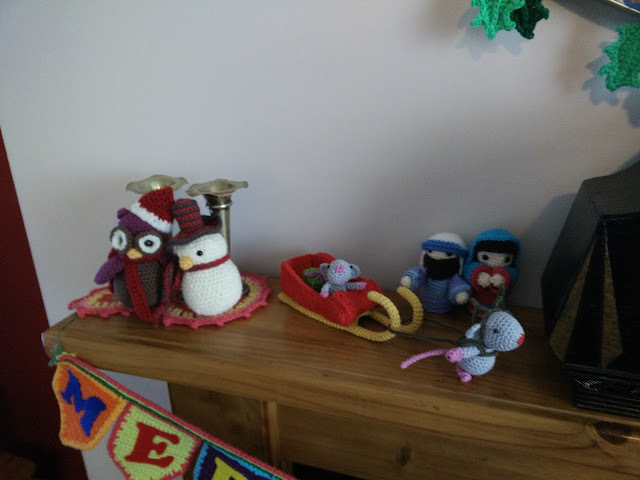 I’ve been crocheting like the clappers this last week, starting various festive offerings. 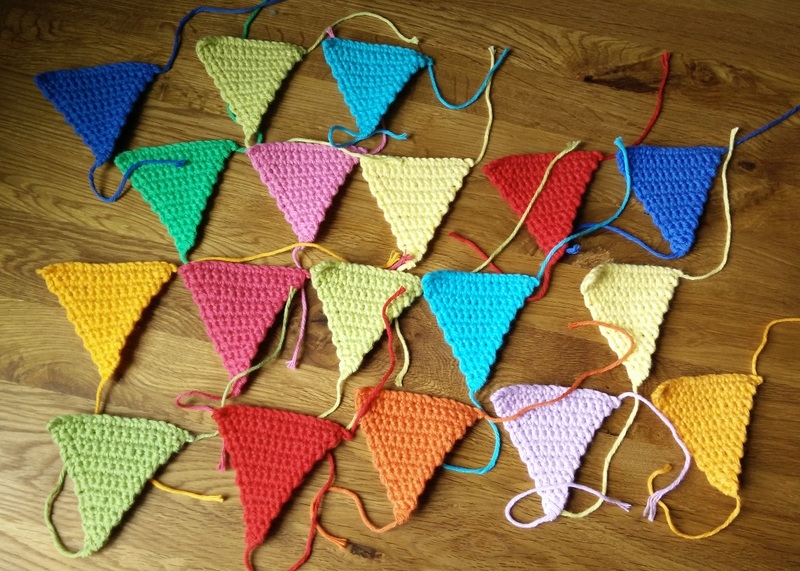 The deadline of 3 weeks isn’t bothering me either as I am only making things that I really want to make.The first thing on my list is bunting! 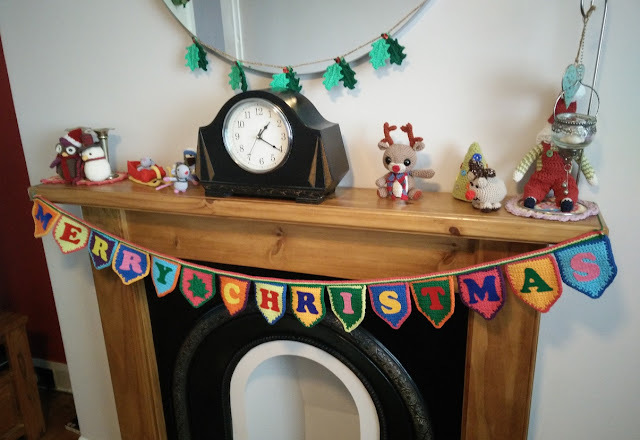 Yes, I know I make a lot of bunting and mostly using Lucy at attic24’s Christmas bunting pattern. 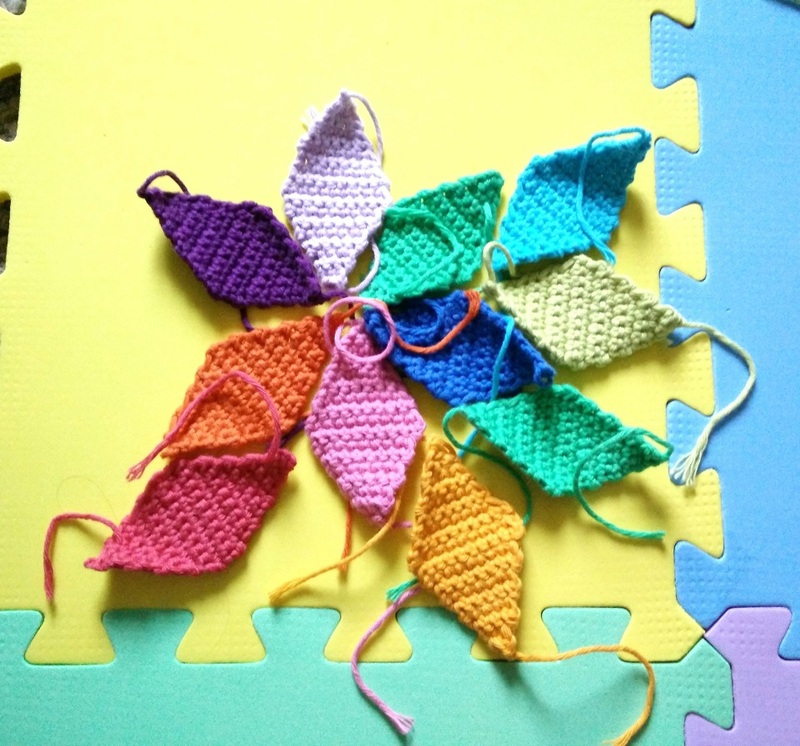 It is such a good pattern and the colours of the Rico are so bloomin’ pretty, I can’t help myself! Just doing the edging now and then I’m going to root out the bond-a-web and felt to get the letters done. I can’t wait to see it finished, I’m far giddier about it than I probably should be. Time to get out my own Christmas bunting and get the house decorated a bit. No tree yet as it’s a bit early for a tree to be indoors in my opinion, I don’t want a blanket of pine needles for weeks on end, but no reason not to have a rummage through my Christmas box. There are the new additions, the mice and Rudolph and my older makes, Nordic Santa (hiding), the start of a nativity (it will get finished one day, probably) and some little softie toys. I really like the way it looks but I always think it is a bit flat, it needs height. 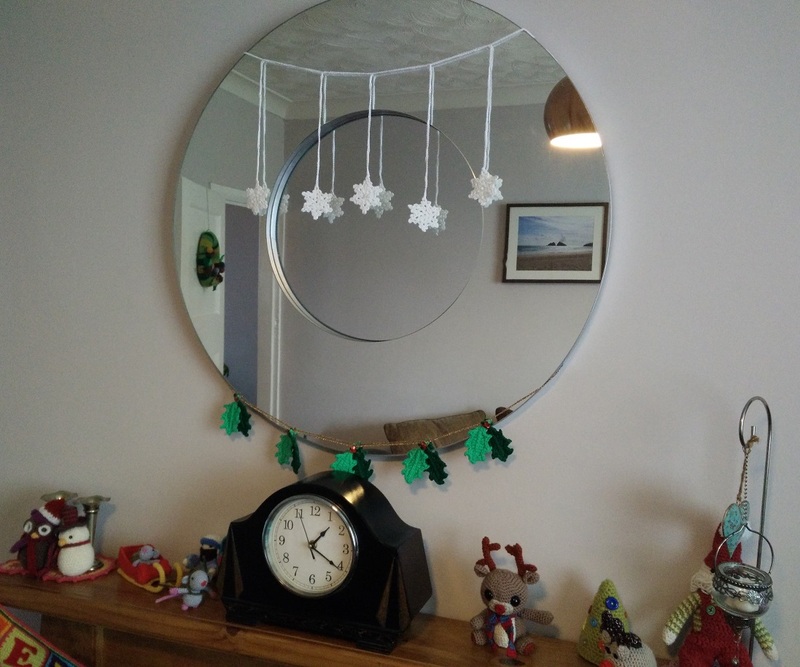 We have a big mirror above the fireplace so I put down the flag making for a while and knocked up a few lacy snowflakes to string up and found some holly I made last year for along the bottom. Think that looks very effective, shame the light is so bad at the moment; it would look lovely on a bright sunny day. 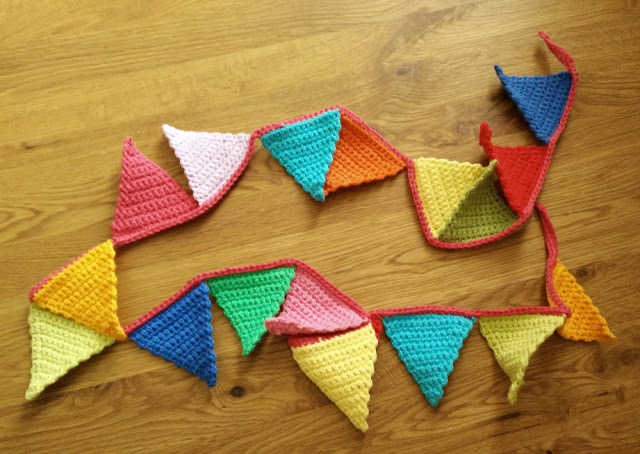 So on with this bunting and then I can start the next thing, it’s a shortlist of two items, both of which I can’t wait to make. I will keep you posted!